Connie Sloan sits with her dog in her Elkview home last month. Sloan’s previous home was destroyed in the June 2016 flood. 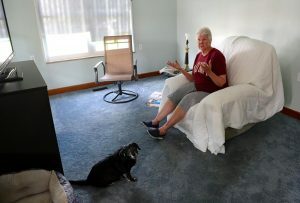 She’s one of a number of residents who are still waiting on a program that buys out flooded property from flood survivors. Until then, she’s paying two mortgages, she said. CHARLESTON, W.Va. — More than two years after the flooded Elk River destroyed her home in Elkview, Connie Sloan finds herself struggling to make two mortgage payments. One is for the house where she and her granddaughter moved to after the flood. The other mortgage is on the one ruined in the flood. Now it’s just a vacant piece of land along Elk River Road. Sloan is one of a group of survivors of the June 2016 flood who opted for a Federal Emergency Management Agency buyout of their properties instead of repairing or rebuilding their flooded homes.